In 1995 Vice President Al Gore wrote a book entitled “Earth in the Balance”, highlighting the adverse global changes which have occurred since the industrial revolution and their impact on our very existence. He pointed out the adverse consequences of the emissions of greenhouse gases, the continued loss of top soil, and the pollution of our environment. He stressed an urgent need for global action to balance our human needs with our planet’s ecology and today he has been recognized for his efforts by being awarded 2007 Nobel Peace Prize. He and the general public are seeking drastic solutions, but many experts are concerned with costs to the worldwide economies, especially today, when there is a critical need to meet the basic requirements of rapidly increasing population and the burgeoning economic crisis. The MicGAS biotechnology offers an economic and practical approach of utilizing our vast resources of coal to reverse the adverse global impacts. Coal, to date has been primarily used as fuel or carbon. 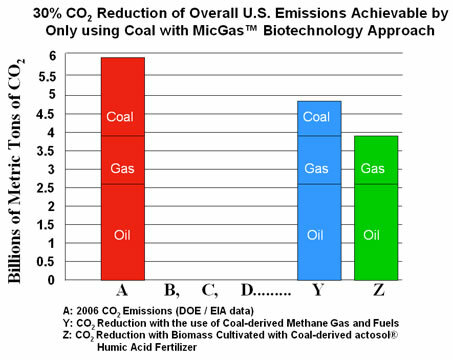 The MicGAS biotechnology converts coal into clean fuel gas (methane or natural gas) and organic humic matter. The primary strategy of the technology is to capitalize on the plant origin of coals to create highly useful carbon-rich humic products, while bio-converting coal into methane gas for production of affordable, clean energy. The humic matter derived from coal is same as the natural humic component of organic soil matter, and is useful for replenishing soils for increased food production, recycling wastes, and cost effectively cleaning our contaminated waters and soils. This results in sequestration of carbon while fostering worldwide economies with green products made from coal. The U.S. DOE in 2007 highlighted this biotechnology approach among the fourteen transformational technologies. The industrial revolution, which started about two centuries ago, has been fueled with ever increasing use of fossil fuels, most notably coal. This has resulted into unprecedented economic growth worldwide, and has changed forever our relationship with our planet earth. One of the major impacts now recognized is global warming resulting from build up of greenhouse gases, especially CO2 due to burning of fossil fuels. The greenhouse effect, by which a small amount of solar heat is retained near the surface of our planet, is critical to maintain the fragile life and ecology. However, unacceptable levels of accumulation of these gases in our atmosphere is now believed to cause gradual heating of the planet. This effect has the potential to cause drastic adverse ecological imbalances for inhabitants throughout the world. In December of 1997, the United Nations sponsored a Global Climate Convention held in Kyoto, Japan. At this convention, 160 Nations gathered for landmark negotiations and negotiated a treaty to reduce worldwide gas emissions. The objective of the treaty is to reduce emissions levels to those below 1990 levels, between 2008 and 2012. Next round of negotiations are planned later this year in Copenhagen to establish reduction levels beyond 2012 and pressure is mounting on the U.S. to join the treaty. Today, the U.S. is home to only 5% of the world’s population but emits over 25% of its greenhouse emissions. The new U.S. Administration has set a goal to drive emissions to 80% below 1990 levels by 2050, which were 5 billion tons for CO2, the largest greenhouse gas. This goal was included in the House Bill, recently passed by a very thin margin. The energy experts agree with the overall reduction levels, but are concerned with the lack of viable technological solutions and predict that this requirement will drive up the cost of electricity and fuels. The climate experts assert that significant rapid reductions are critical to reverse the ecological impacts. Many are still questioning global warming and are concerned with its high costs. Today, in spite of the economic crisis, it has become urgent to address this planetary need not only by the U.S. but also by the majority of the inhabitants of this world. A number of varied strategies for CO2 reduction being considered include: improved fuel and energy efficiency, forestation, and reforestation of lands to increase CO2 adsorption; capture CO2 for reuse and disposal in land and ocean reservoirs; and switching to less CO2 producing fuels. Recently, there has been a big boost for biofuels especially ethanol in response to high oil prices and need for replacement of toxic additives such as MTBE. However, substitution of ethanol for petroleum fuels does not address the needed CO2 reduction requirements. Already a significant progress is being made in improving energy efficiency, but most experts believe that even though it is beneficial, it is not sufficient to address the problem. The MicGAS biotechnology approach sequesters carbon but as useful products while creating economic value from it. Coal, being the least efficient fuel in terms of Btu to electric energy, and highest CO2 producing fuel compared to natural gas and petroleum fuels, faces a serious challenge and may become obsolete. Coal is the most abundant and cost-effective biomass (albeit buried biomass) available today. Carbon contained in coals costs less than 1 cent per pound, whereas cultivated biomass is 10-20 times more expensive as it consumed enormous amount of energy and other resources to produce. Sustainability of abundant coal resources as a viable fuel in the strategy is not only needed to produce low cost energy, but also to sustain the enormous economic infrastructure which millions of Americans depend upon for employment. The power industry depends upon coal for more than one-third of its fuel needs, and constitutes the largest market for coal. The conventional method of generating electricity with coal involves spraying finely pulverized coal, along with hot air, into a furnace chamber lined with water-filled coils. Coal burning inside the chamber converts the water in the tubes to steam, which is then used to rotate a turbine-power generator. This process, devised more than a century ago, is termed the “Rankine Cycle”. The use of emissions controls has recently been mandated to prevent pollutants such as sulfur dioxide and fly ash from being discharged into the atmosphere. Alternatives to this approach have also been explored. However, successes in the development of synthetic fuels and coal gasification have been limited due to the high costs involved with these conversion technologies. Today, due to increasing dependence on vulnerable supply sources of oil, coal is again being considered for production of synthetic fuels utilizing the WWII thermal technologies. Technologies based on these thermal conversion have been in use in South Africa for many years. These plants were built in South Africa due to oil embargo during apartheid to meet domestic fuel needs without regard for economics. But the implementation of these technologies has remained elusive due to fluctuating oil prices of the past four decades. An integration of MicGAS Coal Biotechnology with proven methane reforming and Fisher-Tropsch results in producing liquid fuels at prices, which will compete with $5-10 per barrel oil, which still is the real production costs of almost 70% of the world oil supply today. More importantly it will create in an economical approach of removing CO2 from atmosphere through increased biomass, which will result from use of humic acid. In one innovative stroke, this technology would create a practical approach of mitigating effects of CO2 greenhouse gas while enhancing economic growth of the United States and worldwide economies. - Constitutes a “no regrets” strategy for CO2 control. The innovative MicGAS technology is based upon applying natural microorganisms adapted to convert coal into clean fuels under anaerobic conditions. Unlike the conventional coal gasifier, the solid residue from the MicGAS anaerobic treatment is not a waste, but is rich in organic humic matter.The residual coal from this treatment is further subjected to biochemical process for extraction of humic acid This valuable byproduct has applications as a fertilizer material and also in environmental remediation. ARCTECH has developed this technology by adapting microorganisms (derived from wood eating and humus eating termites) to coal in presence of other appropriate nutrient components. The process conditions have been optimized, so that the technology can be applied in typical sewer treatment bioreactors. The technology has also been adapted for conversion of unmineable coal and residual oil in reservoirs into clean methane gas. The bioconversion is accomplished in three major steps. In the first step, the hydrolytic and fermentation process, microbes convert the coal into volatile organic liquids (primarily acetate and CO2). In the second step, the liquid from the first step, along with the gases produced, are contacted with methanogenic (“methane producing”) microbes which hydrogenate the acetate and CO2 to methane. The methane produced is separated and the unconverted residual coal then, in the third step, undergoes a biochemical conversion. In this step, the coal residue is converted into humic acid for formulating into agriculture and environmental products. In its simpler version, the MicGAS technology converts carbon in coal into two primary components. One is hydrogen rich clean fuel gas and the second is carbon rich humic acid products. The use of clean fuel gas in higher efficiency advance power generation systems such as gas turbines and fuel cells, will keep the costs of electricity production low, while reducing the emission of CO2 emissions for every unit of power production than today’s approach. The use of humic acid for enhanced vegetation will further remove carbon dioxide from the atmosphere through natural processes. This coal utilization concept is similar to that used in an oil refinery. A barrel of crude oil as a result of cracking and refining provides a multitude of products that are valued several times higher than the price of crude itself. The higher value obtained from the sale of these by-products (petrochemicals) enables the oil industry to sell #6 oil at almost the same or below the price of crude coming into the refinery. Implementation of the MicGAS technology, while creating a solution to global warming, will also result in creating a ten fold increase in value from a ton of coal over today’s approach of coal utilization. Though the strategy of MicGAS follows the oil refinery multiple product scenarios, it centers around products based on humic acid products unique to coal. These products will serve large agricultural and environmental market sectors, and thus will not compete with traditional petrochemical products. A widespread application of humic acid products is therefore needed to mitigate CO2 emissions and at the same time create high value from our vast coal resources. Thus, ARCTECH in the past ten years, has developed several innovative applications of humic acid for both agriculture and environmental markets. Humic acid is a black to brown, highly functionalized, carbon rich macro-molecule. The structural makeup and properties of this chemical have been the subject of extensive research studies at various universities and research institutions throughout the world. Recently, the pre-eminent researchers at three universities (Temple and Northeastern in the U.S. and Birmingham in the U.K.) have announced a breakthrough understanding of the humic acid molecule. They have evaluated humic acid samples from a wide variety of sources and locations in both North America and Europe, and have found these materials to be remarkable in not only uniform chemical composition but also similar attributes in terms of ability to capture metal ions. These researchers have put forward a new model structure (TNB Model) of this uniform polymer consisting of repeated units called building blocks. These building blocks are joined together through a peptide-like linkage. Joining four building blocks results into a helical structure. This helix has a central cavity for water, metal and solute binding. The water filled helical model is consistent with properties of many different humic acids extracted from many different places. As a water retainer, metal binder, and absorbent, humic acid is essential to maintenance of fertile soils. Humic acid’s water retention property gives the earth a thermal buffer capacity that prevents catastrophic climates. The versatile characteristic properties of humic acid include: a high cation exchange capacity, the ability to chelate metals, the ability to adsorb organics, a high water holding capacity, an ease of precipitation at low pH or in the presence of coagulants, and an ease of combustion due to its organic nature. These versatile properties are useful for agricultural and environmental purposes. The above described diverse properties of humic acid make it extremely useful material for increasing yields and nutrition of our food, while enabling safe agriculture practices. The environmental applications include cost effective removal of both metal and organic toxins from contaminated waters, recycling of industrial wastes, and even the safe disposition of the most dangerous chemical agents and explosive chemicals devised for the military warfare. Recognizing the potential for MicGAS technology, ARCTECH has built a prototype-production facility to produce humic acid from inherently-humic rich lignite. At this facility in South Boston, Virginia, ARCTECH produces humic acid and formulates it into commercial actosol® fertilizer products. ARCTECH is also conducting several developmental projects focusing on environmental cleanup of the U.S. DOE Weapons Complex, and the safe disposal of DOD munitions. actosol® fertilizer products are being successfully marketed worldwide. In the U.S. actosol is widely used for golf course maintenance, landscaping, erosion control, and for agricultural crops such as corn, wheat, and soybean. actosol is also being successfully marketed in the Middle East to enhance growth of alfalfa, palm trees, and other crops grown both in greenhouses in the harsh desert climate. On the prosperous island of Mauritius, in the Indian Ocean, actosol is being used to increase yields of sugar cane, while in South Korea, actosol has been introduced into the marketplace for golf course and greenhouse applications. actosol is presently being tested for distribution in the Chinese market. The primary benefit demonstrated in these applications is that yields of crops and plants increase 10-100%. This results in a net value gain of about 4 to 20 times of costs to a farmer. In 2004 USDA, approved the use of humic acid for organic food production. The US EPA in 2003 under FIFRA laws allows use of actosol humic acid with pesticides as adjuvant and accepts actosol® safe for food production. actosol is also on approval list of OMRI as organic fertilizer. Several projects are underway at ARCTECH to implement applications of humic acid to meet our challenging environmental needs. These projects include the successful development of a novel adsorbent termed HUMASORB®-CS (a water insoluble polymer). This novel adsorbent has been shown to remove both inorganic and organic contaminants in a single step from water at a cost savings of as much as 50% than conventional approaches. HUMASORB®-CS is being emplaced as a subsurface barrier at large groundwater contaminated sites, thus presenting a permanent low-cost solution. Two patents on this highly versatile adsorbent have been awarded by the U.S. Patent Office (#5,906,960 and #6,143,692). ARCTECH is also successfully demonstrating applications of its humic acid-based ACTODEMIL technology for recycling of nitrogen-containing energetics from conventional munitions into usable fertilizers. This fertilizer product has met all regulatory requirements, and was approved for use by the Nevada Division of Environmental Protection for land application. The U.S. Patent office awarded a patent to ARCTECH on July 25, 1996 under Patent Number 5,538,530, entitled, “Method for Safely Disposing of Propellant and Explosive Materials and for Preparing Fertilizer Compositions”. The U.S. Army selected ARCTECH’s Actodemil® technology for further evaluation for the safe disposal of chemical munitions, which contain both energetics and chemical agents. These applications truly incorporate the philosophy of “swords to plow shares”. ARCTECH’s vision and strategy of MicGAS technology clearly provide a means of utilizing coal for cleaner power generation and enhancing the planet’s ecology, while creating economic growth. This strategy would also create a path forward, most probable in this century, towards hydrogen based energy systems. A fully integrated approach of using coal to produce cost effective energy, enhance agriculture and protect the environment shall mitigate greenhouse effects, and at the same time initiate the start of the second industrial revolution….just as steam production from coal combustion helped to propel the first industrial revolution, two centuries ago. MicGAS is a hydrogen-rich clean methane gas (CH4) produced from coal by specially engineered microbes. Gas composition ranges from 60-80% methane and remaining carbon dioxide (CO2). Higher rank coals produce more methane enriched gas than lower rank coals. MicGAS can be utilized for heating, power generation, upgraded by removing carbon dioxide to natural gas generally 90%+ methane or converted in to liquid fuels such as diesel and jet fuels with commercially proven Fischer Tropsch conversion process. Commercial and environmental significance of MicGAS™. Through its development of the ARCTECH Process, we have continued to substantially improved efficiencies and production techniques associated with MicGAS production from coal. We know of no other coal gasification technology, in either ex situ or in situ circumstances, that presently claims to successfully gasify coal at near ambient temperatures and without the need for significant costs associated with thermification. This uniqueness presents major opportunities for both reduced carbon footprints and cost efficiencies for “coal gasification” processes. Moreover, our in situ techniques are best suited for what is categorized as “non-recoverable” coal and it does not scar the environment through strip mining. MicGAS provides a cost-effective alternative to imported oil that can successfully compete at price parity or below, and unlike other alternative energy methods, without the need for government subsidies. Bioconversion is accomplished by adapting micro-organisms (derived from termites) to coal in the presence of other appropriate nutrient components. Termites are, after all, nature’s engineers. 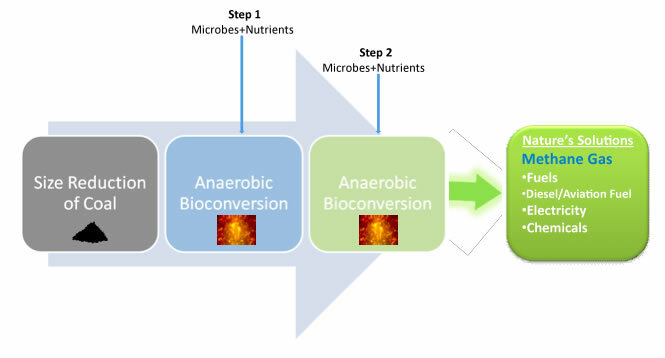 Bioconversion is achieved in a two-step process. Step 1: In the hydrolytic and fermentation process, microbes convert coal into volatile organic liquids. Step 2: The liquid, along with gases that are produced, are contacted with methane-producing microbes that hydrogenate the acetate and CO2 into methane. Coal, a buried biomass being predominately comprised of carbon, is amenable for biological conversion and is the cost-efficient alternative to ethanol. This process does not compete with the food supply, absorbs carbon dioxide, and makes goal green again. Our MicGAS technology offers an effective pre-combustion carbon sequestering method for coal; thereby reducing CO2 by about 67% compared to today’s coal conventional combustion technology. Further processing the CO2 with Humasorb can sequester the remaining carbon resulting in a neutral carbon footprint by retaining the humic substances in the soil. Learn how our process can generate a negative carbon footprint at a coal-fired power plant. How MicGAS™ Technology Creates Negative Carbon Foot-Print from Coal Use? A 1: Higher efficiency, methane-based power generation systems would result in less carbon dioxide production over the conventional coal combustion power plants. For example, today’s coal power plants produce an average of 1.2 tons or 2,200 pounds of carbon dioxide for every MW of power. These conventional power plants based on combustion require about 10,000 Btu/kwH referred to as heat rate. Thus one ton coal with average heat content of 20 million Btu’s results in the production of 2,000 kwH or 2 MW of power. One ton of coal, with average 60% carbon on combustion, will produce 2.2 tons or 4,400 pounds of CO2. Therefore, 1.2 tons or 2,200 pounds of CO2 per MW is the result. MicGAS technology can produce 1,000 to 10,000 SCF of methane gas per ton of coal depending upon the coal rank and source. Almost 25% of the carbon, or 300 pounds out of every 1,200 pounds of carbon per ton in coal results in the production of 10,000 SCF of gas. This gas, when utilized in higher efficiency combined cycle gas turbine power generation systems with an expected heat rate of 6,500 Btu/kwH will result in 1.5 MW. This results in only about 735 pounds of emissions of CO2 per MW compared to 2,200 pounds or 1.2 tons of CO2 per MW with today’s coal combustion approach. This offers a potential direct benefit of over 66% direct reduction of carbon dioxide, or 1,465 pounds less per MW compared to today’s approach of coal powered generation. A.2: It is well documented scientifically that humic acid in soils are retained as stable molecules without degradation into carbon dioxide and water. Only under arid and very high temperatures does humic acid decompose. Also, HUMASORB®, after its saturation with contaminants, can be safely retained in landfills; therefore all the carbon in humic acid Actosol® and HUMASORB® products will be permanently sequestered. Thus the 70% of carbon which was converted in to humic acid products will amount to sequestration of 3,300 pounds of CO2 per ton or 2,200 pounds per MW. B. Indirect impacts are realized by using humic acid fertilizer for enhanced biomass for CO2 sink. The USDA reports that tree biomass on each acre of land captures 6 tons of CO2 and releases 4 tons of CO2 per year. The Kyoto Accords allows for credits of 3-6 tons of CO2 reduction per year per acre for 80-100 years of lifespan of trees depending up on tree species and geographical location. Kyoto requires cultivation of tree biomass on about 10% of land. The remaining land can be used for cash crops and food production. The 1,000 gallons of humic acid co-product from the same ton of coal that produced gas, can be applied to 20 acres of land at an average of 50 gallons per acre per year. Based on a lower capture rate of 3 tons of CO2 per acre per year from 20 acres, this would amount to 60 tons of CO2 sequestered. Very conservatively, if we claim only 10% of it is attributed to increased biomass due to humic acid input, then this will amount to 6 tons of CO2 sequestered from the 1,000 gallons of humic acid produced from a ton of coal. Consequently, per MW will be 6 Tons /1.5 MW =4 tons. Capture of carbon in tree biomass offers an opportunity to create a permanent sequestration to bury tree biomass in engineered landfills for future use or permanent retention with minimal degradation. For every ton of buried biomass taken out of the ground in form of coal, this program will be putting back more than 5 tons of CO2 equivalent biomass into the ground. MicGAS technology offers an effective pre-combustion carbon sequestering method of coal use. For extraction of one ton of buried biomass coal, it will enable putting back almost 5 tons CO2 equivalent biomass and permanently sequester it. This technology strategy is a “no regrets” approach to global climate control. For example, if it is determined in the future that buildup of carbon dioxide had no significant impact on climate, then at the very least, the use of humic acid products, as sequestered carbon would have been for economical benefits. 1. 1997 EPA Munitions Rule: accepts recycling of explosives into fertilizers as a Non-RCRA activity. 2. Nevada EPA in 1999 commended ARCTECH for Actodemil® demonstration at Hawthorne Army Depot. 3. October 2000 proposed EPA regulations for industrial wastewater treatment mandates stringent cleanup levels. HUMASORB® would enable industries to meet these standards. 4. 2003 EPA Rule: accepts use of Actosol humic acid in growing crops as safe and exempts for any tolerance requirements. 5. 2004 USDA National Organic Food Production Rule: authorizes the use of humic acid for growing organic foods.